He was somewhere between the age of 17 and 25 when he died, apparently of natural causes. But for reasons that are unclear, this warrior’s body was speared and clubbed prior to burial, in what is now a fascinating Iron Age mystery. A distinct possibility is that it was done to prevent him from rising from the dead, say archaeologists. Two intriguing 3rd century BC grave sites were uncovered by the MAP Archaeological Practice at the Pocklington site in Yorkshire, as archaeologist and science writer David Keys reports in the Independent. The first gravesite contains the skeletal remains of a young man, which exhibit signs of an elaborate, gruesome funeral ritual in which his dead body was stabbed repeatedly. A woman roughly the same age was buried nearby. The second gravesite contains the remains of an older individual who was buried along with his chariot and a pair of horses. Disturbingly, it appears that both horses were buried alive. One potential explanation is that, although he was a respected warrior, he had died of natural causes, and not in battle. Perhaps significantly his shield had been deliberately dismantled. But the ritual spearing of his corpse might have allowed him the privilege of finally dying a warrior’s death. What’s more, as in the Pocklington case, the metal or other objects used to pierce the corpse were usually not withdrawn from the dead body, but were left there—in effect, for eternity. A third possibility is the individual was put in the ground alive and then ritually murdered. But for this third scenario to work, the archaeologists would have to explain the absence of defensive wounds and the orientation of the body in the fetal position. It’s not an outright impossibility that the man was murdered during the ritual, as some kind of offering, but the first two scenarios seem more likely. Paula Ware, the director of the project, believes the wounds were inflicted after death, an act done to “release the youngster’s spirit, and...a sign of respect from the community,” as the Yorkshire Post reports. Another possible clue could come from a grave located nearby—that of a woman, also between the age of 17 and 25 when she died, and who had spina bifida. The archaeologists are planning to conduct genetic analysis of both skeletons to determine if the two might have been related. The second gravesite, located about 180 feet (55 metres away), is just as strange. The grave contains the body of a high-ranking elderly man, who was in his 60s or 70s when he died. He was buried in his chariot, along with two adult horses still attached—as if to suggest these beasts of burden would carry on their duties in the next world. 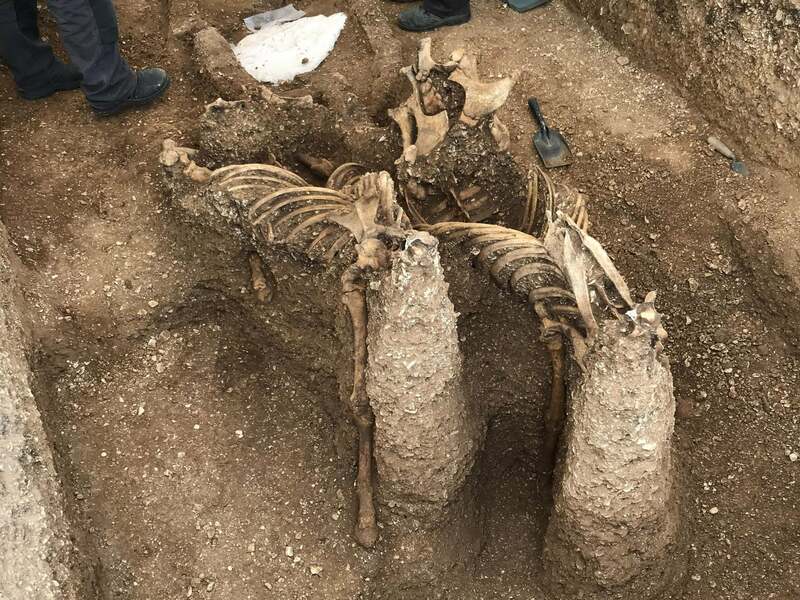 As noted in the Independent, these horses, possibly ponies, may have been dropped into the grave while still alive and, while they were still standing upright, were buried until they could no longer move. In the final act, the horses were decapitated. The archaeologists suspect the heads were place atop the gravesite as if to stand guard. In addition to the chariot and horses, the man, who was in his clothes and set in a fetal position, was buried with an elaborate bronze brooch and a shield made from bronze, wood, and leather. The grave also contained the bones of a half-dozen piglets, which may have been consumed during the man’s funeral feast, the archaeologists speculate. A similar Iron Age chariot and two horse skeletons were uncovered last year at a different grave site, also at Pocklington.